During the 2015 World Cup, Associate nations protested vociferously against the decision to reduce the size of the World Cup to ten teams from 2019. According to many, including Ehsan Mani, the former ICC president, the decision was driven largely by a wish to ensure more games between the largest nations, after Ireland and Bangladesh had knocked out Pakistan and India in the first round of the 2007 World Cup. Although a report from the ICC subsequently found that Associate nations were "embraced more than in any previous" tournament and found that Associates had narrowed the gap on the field, there was no changing the decision. Against this background Scotland set out to qualify for the 2019 tournament in the World Cup Qualifier in Zimbabwe last year. While their neighbours Ireland had defeated five Test nations between the 2007 and 2015 World Cups, Scotland had struggled to make an impact in global events. Their first victory in a global tournament came in their 21st game, when they defeated Hong Kong in the 2016 World Twenty20. After that tournament, when Scotland squandered dominant positions against both Afghanistan and Zimbabwe, head coach Grant Bradburn addressed the squad at a meeting with the squad in a pub in Dundee. Kyle Coetzer, Scotland captain: He put up on the screen a picture of a straight road and a windy road. It was decided that we weren't just going to take the straight, easy road to try and get easy results or easy training methods. We were going to take the windy road, which was going to take a bit longer. For us to win games we need guys to get 120, not just a good 70-odd, which looks good and people in Scotland say, "Oh, that's a good effort getting 70 against a Full Member." From a team perspective, if we just scored 200 against a Full Member - well done, Scotland, we got 200 against Australia or whoever it was. Until we changed that mentality that 200 no longer is good enough, because that's never going to win us a game against a Full Member, there's no point in playing. We've discussed in ODI cricket we want to be a 320 team. Grant Bradburn, Scotland head coach: Since the World Cup experience in 2015, where the team didn't win a game, there was a new realisation of the standards that needed to be met and achieved from both players and staff. Even coming back to Scotland and training in freezing, wet conditions, the whole group accepted the challenge of becoming a top ten nation. After the 2016 T20 World Cup the whole group sat down in an old pub in Dundee and agreed a new direction. Due to lack of fixtures and financial constraints, Scotland were constantly damaged by the unavailability of crucial players, who often played for their counties instead. Their plight was highlighted when their captain, Preston Mommsen, pulled out of his Cricket Scotland contract at the end of 2016, taking up a full-time role as a property investor, frustrated at the paucity of opportunities to play international cricket. In 2017, Scotland registered their inaugural ODI victory over a Full Member, when they beat Zimbabwe. Earlier that summer, they defeated a full-strength Sri Lanka in an unofficial ODI. They also lost matches to Namibia and Papua New Guinea and failed to make it to the new 13-team ODI league comprising the best in the world. Towards the end of 2017, Scotland found out that Con de Lange, the vice-captain who had taken five wickets in the win over Zimbabwe, had been diagnosed with a brain tumour. In March 2018, they travelled to Zimbabwe for the World Cup Qualifier, contested by ten teams for two berths. They arrived at the tournament having only played four ODIs against Full Members since the 2015 World Cup, but as holders of the previous World Cup Qualifier trophy. Ben Fox, Scotland media manager: The general feeling was different from other tours I'd experienced, even compared to the 2015 World Cup and 2016 T20 World Cup. Before that first game Grant Bradburn insisted that each player was presented with their cap and shirt at a local restaurant. Gordon Drummond did the honours and I remember the whole thing as quite an emotional experience. The importance of playing for Scotland wasn't lost on anyone that evening. Bradburn: As coaches we gave the players full ownership of our campaign in terms of identifying the challenges we would face, what style of cricket we believed would win the qualifiers, even to the point of allowing the players a voice on what line-up they believed would achieve our goal of winning the tournament. We felt to win now consistently with an aggressive, hostile style of play, we needed the players themselves to own it. From game one in Zimbabwe, our players adopted an amazing air of confidence in being able to express each of their unique skill-sets as we set about to confront our opposition with a new Scotland style. 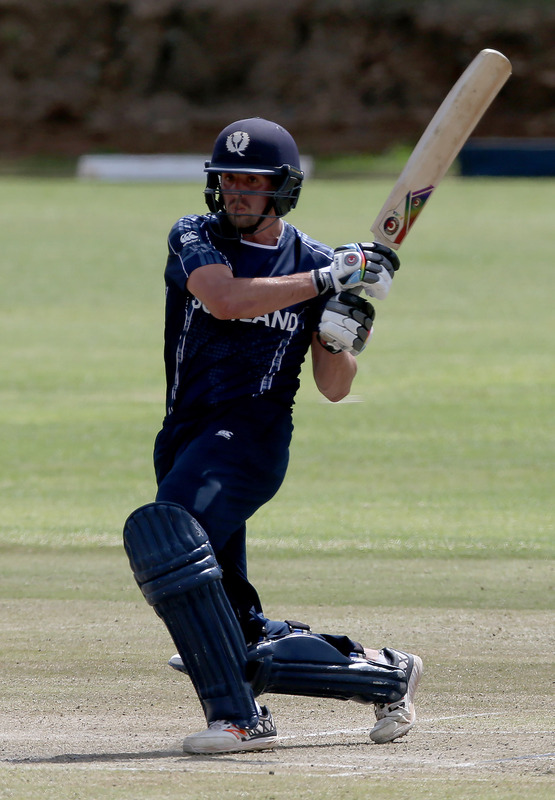 In their first game, Scotland chased down 256 against Afghanistan in Bulawayo, with Calum MacLeod hitting a remarkable 157 not out. MacLeod scored 49 off 31 balls he faced from world No. 1 ODI bowler Rashid Khan, which remains the most that Rashid has ever conceded to one batsman in a single ODI. Calum MacLeod, Scotland batsman: The approach I took against all the four Afghanistan spinners was to look to sweep with the aim of putting some pressure back on them. Leading in to our tour of South Africa before Zimbabwe I had not been using the sweep much, but I spent a good hour on a Merlyn bowling machine just working on it till I was comfortably enough to make it my go-to shot again. Bradburn: Watching Calum and Richie [Berrington] taking down the No. 1 bowler in the world by bringing to the middle the shots we knew they possessed was so captivating and inspirational. That confidence spread through the team. Everyone was now possessed with this new-found aggression and hostility. Coetzer: The conditions were all in favour of spin. He was literally picking out where he wanted to pick him. I don't think there's been a finer innings against Rashid Khan. It was certainly one of Scotland's best innings. Scotland subsequently defeated Hong Kong and Nepal to qualify for the Super Sixes stage, and then tied a thrilling game with Zimbabwe. During an extraordinary end to the match, the electricity generator kept going down. Fans following around the world had to rely on video footage from Zimbabwe captain Graeme Cremer's wife, a decision that brought into focus the ICC's decision to only fund the broadcasting of ten of the 34 qualifying matches - a notable contrast with other major sports. Fox: The stadium was packed to the rafters with Zimbabwe fans. I can still recall the noise of those final deliveries and all the world could get information was from my phone on the boundary. It was a surreal experience. For me, that was the game of the tournament as a cricketing spectacle, but only those there on the day were able to watch it. The time zones would have worked out perfectly for us to get a swathe of public support if all our games were broadcast or streamed, particularly after the first game against Afghanistan. Even low-quality highlight clips were few and far between. The amount of people I speak to about that tournament now - avid Scottish sport fans - who have no idea that tournament took place is astounding. Scotland subsequently beat UAE in their first Super Sixes game, taking them to the top of the standings. They had bowled their opponents out in their first five games of the tournament, reflecting a more aggressive bowling style. Against Hong Kong, offspinner Tom Sole was even given a short leg. Scotland had two matches to play, against Ireland and West Indies. Although they did not know it at the time, winning one would have been enough. In the first of those games, Ireland's Andy Balbirnie should have been dismissed lbw for a duck, and went on to make a century to anchor their match-winning total, highlighting the absence of DRS in the tournament. The Ireland defeat meant the West Indies match was a straight eliminator - whoever won would reach the World Cup, whoever lost would not. Coetzer: I literally felt that every team in the world basically was supporting us, except for the West Indies. We had messages from every place going, different social-media platforms, texts, emails, every avenue. It was something quite special - something very, very unique. It just shows the impact that Associate cricket is having. We spoke to a couple of other teams and asked questions. The message we got from some of the teams was certainly West Indies are beatable, other teams felt like they should have beaten them but didn't quite get over the line. We believed that we could beat them. We spoke about the elephant in the room - that it was a big game and let's not hide behind it. Let's embrace it and take it on head first. Scotland had arrived in Harare after an eventful journey. The Zimbabwe president took the team's plane at Bulawayo airport; eventually, they boarded another flight after loading sandbags onto scene to balance the aircraft. A few players - including Coetzer, Berrington and the assistant coach Toby Bailey - had opted to travel by bus instead and ended up arriving much sooner. Coetzer: Richie, Toby and I were in Harare in the bar watching West Indies play a game at the time, sitting with the analyst with a laptop open studying their players. There were certainly different tactics going into it. We decided to put men back rather than let them hit over. Normally we'd keep a man up against most sides to try and get a wicket but we felt their ego would possibly get the better of them and they would still try and hit over our fielders. In the third ODI ever played between the sides, and the first for 11 years, Coetzer won the toss and elected to field first. Off the very first ball of the game, Chris Gayle edged Safyaan Sharif behind. Safyaan Sharif, Scotland bowler: Kyle and I were discussing what ball to bowl to Gayle first ball because he has a few weak points early on in his innings. It was either going for the yorker full and straight or just hitting a good area and I decided that I should just hit the wicket hard, hit a good channel and get the ball to swing or nip. As soon as I released the ball I had a feeling I'd pitched it in the right area. That was the plan - to hit the channel and make him come forward, because we know that he doesn't move his feet early on. Several of the bespoke plans that Coetzer and company had hatched in the Harare bar came off. Coetzer: For Marlon Samuels, tactically, we had a really, really wide long-off and really, really straight deep cover, because he hits over there all the time. We got him caught in between those two positions. There were some hugely different tactical approaches we took within that game specifically for certain players. Scotland needed 199 to reach the ten-team World Cup - and in the process knock out West Indies, two-time World Cup champions. Coetzer was out in the third over, and Scotland fell to 25 for 3. Berrington and MacLeod, who had shared a partnership of 208 against Afghanistan, rebuilt the innings. This time, they batted much slower, adding 42 in 15.5 overs. Bradburn: After being so positive throughout the campaign with bat, ball and in the field, we were just too timid at a critical time during that West Indies chase. Our fourth-wicket partnership produced 40 runs in 15 overs, which was totally opposed to the way we had played in the tournament and how the team now wanted to play. Richie Berrington, Scotland allrounder: It was very much about trying to build a partnership, take it as deep as possible so we could get ourselves back into a winning position. At the time they were bowling well from both ends so it was a tough little patch for us to get through. We both know that once we get in we can get ourselves in a winning position. Afterwards you can always look back and say was there a different way we could have gone about it. When he was on 33, and the score 105 for 4, Berrington was hit outside leg stump against Ashley Nurse's offspin, with the ball sliding even further away from the stumps. He was given out. Berrington: It's one I've seen a lot. It was obviously disappointing, it's never nice to get one that goes against you. There was huge frustration for me having done all the hard work to get in and get us back on track. The frustration goes back more to not having the facilities to go through the review process. I knew after being at the crease for a while it was important that I was going to be there at the end. Coetzer: Technology could have been there for a game of that magnitude - look how much that's cost Cricket Scotland in the end if that was the reason we didn't get by. It felt like it showed there was a lack of importance on that tournament. That tournament was plenty of cricketers' livelihoods. It's more than just those cricketers. It goes deeper into the cricket associations and their development of the game in those areas. In Edinburgh, the game was followed from the Cricket Scotland office. Meanwhile, Mommsen met Fraser Watts, a former Scotland player, to watch some of Scotland's chase in a pub during his lunch break. Around this time, at the venue, fast bowler Ali Evans turned to Bradburn and said, "It would be very Scottish to lose by rain." But the rain, if it came, did not look like it would be substantial. The groundsman had earlier told Bradburn that there was "nothing major on the radar - it won't be much". Clouds were beginning to loom as Michael Leask arrived at the crease. When he had reached 14, off ten balls, the players had to go off. Scotland were 125 for 5 after 35.2 overs, five runs behind on Duckworth-Lewis. Berrington: From what we could see and what we'd heard from a couple of people it was just going to be one of those quick, heavy showers which you get sometimes in Africa that pass very quickly. Michael Leask, Scotland allrounder: It was one small cloud that turned into armageddon. I was gutted but still hoped we could get back on. 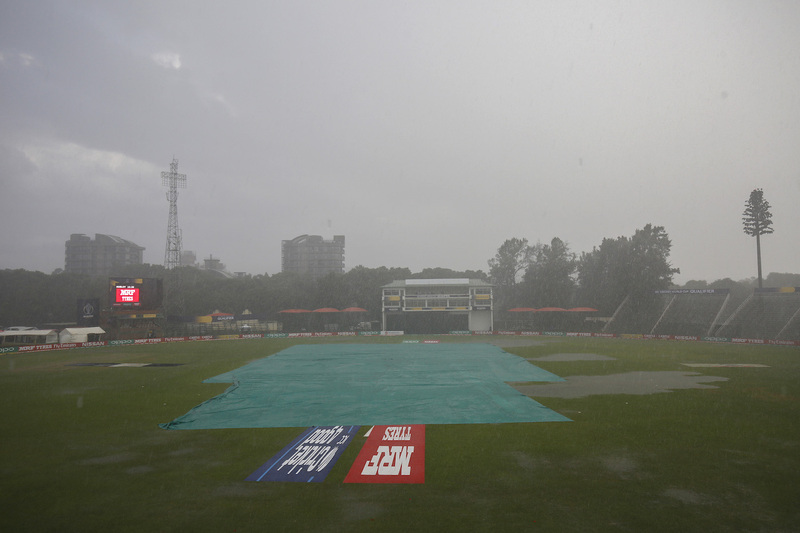 As the rain kept falling, the umpires came to the dressing room and asked to speak with Coetzer. Coetzer: The umpires came and said there isn't enough time to clean it up and get a long enough game. Jason Holder was very humble about it too, it just shows the magnitude of his personality. Going back into the dressing room after that was a sight of many different emotions. Pretty much everyone struggled. It was pretty tough. Scotland had lost by five runs on the Duckworth-Lewis method. With one fewer wicket down, they would have been ahead and reached the World Cup. Berrington: There were a few tears. It was a whirlwind of a tournament. It coming to an end like that was tough. It was pretty brutal. Emotions were very high, some guys were just in shock. We had full belief that from that position we could win that game of cricket. Everyone handles these things differently but after it we got together as we do and we stuck together as a group. But guys did need their own time after the game just to get their head around things. Coetzer: It was pretty quiet. Some people lay down, some people walked out, people did various things. What we could hear which was a real positive for us was them [West Indies] shouting and cheering in their dressing room. That a team of that magnitude were celebrating the way we would have done if we'd qualified. That's certainly a change in the international game. That was one small glimmer of positivity to take out of a pretty crushing day. Bradburn: I will personally never forget the feeling of deep emotion seeing our dream disappear in the Harare downpour that ultimately decided the West Indies game. To hear the West Indies celebrations next door was a dagger blow to everyone in our room and without exception I looked around our room to see everyone in tears. We embraced and shared the pain with a feeling of helplessness to what we had all just experienced. We could see our dream, we could touch it - though we never held it. As if the cricketing gods decided - no, West Indies will be in the World Cup. Preston Mommsen, former Scotland captain: Sitting back at my desk, checking in on the score, I literally felt sick when I read that play had stopped and that they were behind on Duckworth-Lewis. I can only imagine the way the team and support staff would have felt. Had Scotland reached the 2019 World Cup, they would have played more ODIs in the tournament than they managed in the entire 2015-19 cycle against Full Members, and received extra funding of $1 million - almost as much as Scotland get annually from the ICC. Malcolm Cannon, Cricket Scotland chief executive: The figure of $1 million was much bandied around at the time and inevitably the financial side of it would have made a great difference, but qualifying would have meant so much more than money. The funds would have helped preparation for the men's squad ahead of the 2019 finals in England, but would also have been put to good use bringing on the next group of youngsters. This would have been in the form of more fixtures and better access to training camps and expert coaching input. 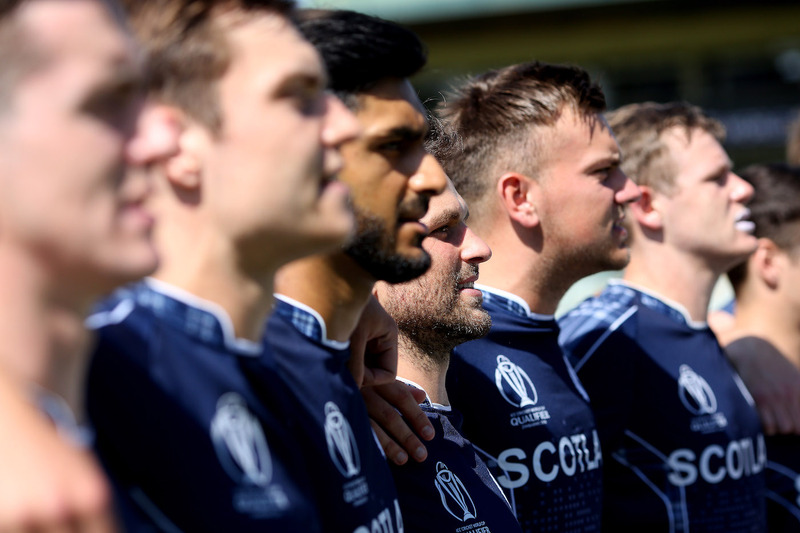 But more than that, qualifying for a ten-team World Cup would place Scotland in an elevated position to attract greater support, greater funding and greater recognition as a cricketing nation both at home and overseas. The increased noise and profile would certainly entice more youngsters into the game and provide enhanced coverage in the traditional press and media. Coetzer: If we had managed to win that day it would have been a huge moment for the whole global game. We'd have been knocking out a previous winner, so it certainly would have made people sit back and realise how far the game's come. Three months later, Scotland played the No. 1 ranked side in ODI cricket, England. Bradburn resolved that the team would channel the agony of their defeat in Harare positively. Before the match, he told the team they were hunting history: "One day Scotland will beat England at cricket, why not this team - if not now, when?" MacLeod made 140 not out - an innings that his team-mates still regard a shade short of his knock against Afghanistan - and Scotland won a remarkable game by six runs, sealed when Sharif dismissed Mark Wood with an inswinging yorker. Sharif: To nail that yorker and get it right on point was perfect. Every time I talk about that game, we always get a smile - every Scotsman gets a smile on their face. England, who previously played Scotland in an ODI every four years, currently have no plans to play Scotland in another ODI. After beating England, Scotland would have to wait another 333 days for their next ODI against a Full Member, when they host Afghanistan in May. Cannon: The nature of the win against Afghanistan, the tie against Zimbabwe and the devastatingly close loss to the Windies proved to ourselves and to the rest of the cricketing world that Scotland is a force to be reckoned with. The victory against England in June only cemented that claim and we go forward with a great sense of self-belief and confidence that we will qualify for the next World Cup. We live in the Associate cricket world where every game is a cup final.